On a stormy, slippery winter morning about five years ago, Mom and I drove slowly down I-195E toward Dartmouth in my old Buick LeSabre. The roads were extremely treacherous. As we got to Exit 11, we noticed that two cars had plunged down into a large ditch and were awaiting assistance. Not to end up like them, I jerked the wheel so that the entire right side of my Buick scraped and bumped the guardrail. It got a bit hairy, and the two gentlemen that were stuck probably thought that I was going to join them in the ditch, but I had a mission. I wanted an omelet. Mom had suggested that we turn back, but I said no. We were going to have breakfast – car accident or not. I pressed on. Finally, after some near misses with sliding into various cars fishtailing on the snowy roads, we pulled into the restaurant parking lot. And that’s the last time we went to Persy’s. Needless to say, we were overdue. Since we were going to be in the area on a shopping excursion for my sister’s birthday, we decided to pay them a visit. We arrived at 10:45 a.m.
Persy’s had done some remodeling to the exterior and interior, and the changes were good. They got rid of that whole ramp-and-extra-door-to-get-inside thing and replaced it with a small waiting area. However, the charm and country cottage setting that I liked about Persy’s was still there, and I was glad. We were greeted right away by a waitress (I didn’t get her name) that seated us at a cute booth away from a pesky air conditioner. She said that people had been complaining of the breeze, and I could understand why. It was a bit cool in there, but we didn’t mind. She took our drink order, and I chose a chocolate raspberry iced coffee ($2.49)while Mom went with a Mochaccino ($2.99). 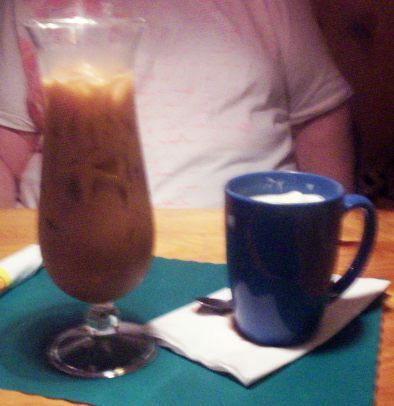 Both arrived in adorable glasses with Mom’s hot drink topped with a dollop of whipped cream. They were excellent and very flavorful. *There had been way more whipped cream on Mom's drink, but she couldn't wait. 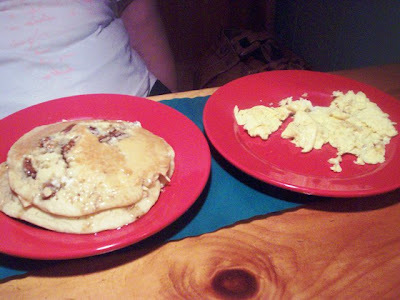 For our meals, Mom ordered the maple walnut pancakes ($6.99) with a side of two scrambled eggs ($1.98). I chose Lisa’s Country Omelet ($7.99), which was made of bacon, cheese, potatoes, sour cream, and chives. My breakfast came with a side of baked beans and home fries, and I also had my choice of bread. I chose their famous grilled cornbread. We couldn’t wait to dig in! Persy’s Place is quite charming, and I always feel relaxed when I’m inside. It’s like you’re sitting in your aunt’s living room waiting for her to bring you a plate of cookies and milk. There are Normal Rockwell posters on the walls, various chicken and geese statues and pictures throughout, and adorable wooden benches that serve as booths. There are also tables at each end of the restaurant. At the front desk, there is a small bakery case where you can buy muffins and cornbread. There are also chalkboard signs around the restaurant advertising the specials. Finally, there is a small gift area that was stocked with New England-style candy and treats. Persy’s Place has several locations throughout Massachusetts, but Mom and I have only visited the Dartmouth restaurant. As for the menu, I just have one word – huge. They actually call it “New England’s largest breakfast menu”, and I agree. It took a while for Mom and me to decide what we wanted simply because there was just so much to choose from. 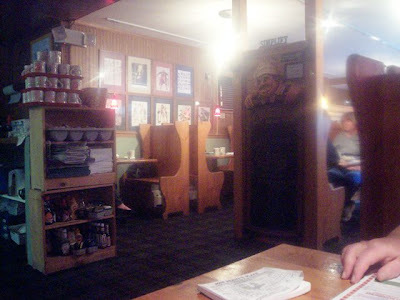 This is the kind of place that you go to when you want an old school New England breakfast, something strange, or something that you haven’t had in a long time. If it exists, and people have eaten it for breakfast, then Persy’s will serve it. Catfish, corned beef on toast (S.O.S. ), Johnny cakes, lobster crepes, and the Monte Christo which I highly recommend. Please check out their menu by clicking the link at the top of the page. They also serve lunch (also a large menu), but breakfasts are their specialty. We hadn’t been waiting long before our breakfasts arrived. Mom’s came out first and smelled amazing. She said that her pancakes were absolutely loaded with walnuts – probably the most nuts that she’s ever had in this particular dish. The walnuts were whole and very flavorful, and the three pancakes were light yet filling. The eggs were buttery and very tasty. My country omelet was excellent. Whoever Lisa is, she certainly knows how to put together a great breakfast! My baked beans came in a mini crock and had that a delicious smoky taste. The cornbread – although quite flavorful – was a bit on the dry side and got messy during the meal. The home fries were good, but I had so many seasoned potatoes stuffed into my omelet that I didn’t have time to concentrate on the extra ones. The sour cream and chives on top gave the omelet an extra kick, and the bacon inside was a little overcooked but still very tasty. It was extraordinarily filling, and I was sorry to have to leave behind a very small piece and some potatoes and beans. This was a very “homey” meal and a perfect New England breakfast. We left $29 on the table for our terrific waitress and paid a quick visit to the restroom. Like the rest of Persy’s, the bathroom was clean and neat. 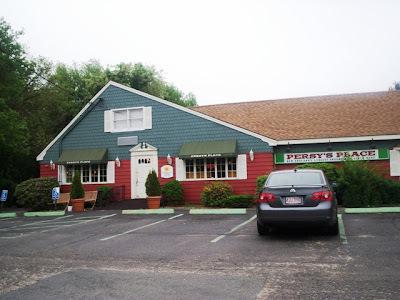 One of the reasons that Mom and I hadn’t been to Persy’s in a while was because the restaurant had started to look a little disheveled. It seemed that they were always hiring, and the people that they did choose to work there were not that qualified. It was basically a bunch of kids with little to no experience as to how to be a server. It seems, thankfully, that they have since corrected that problem. Also, the restaurant always seemed to be on the dirty side. There was silverware on the floor, mashed eggs stuck in the carpet, and sticky tables. This has also been corrected, and we appreciated the cleanliness of the restaurant on today’s visit. 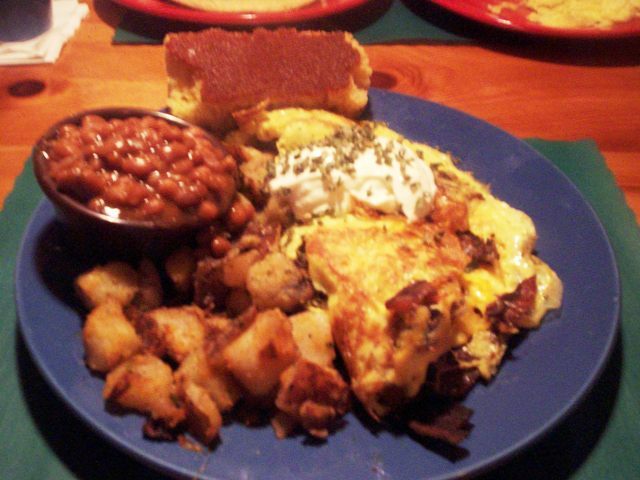 If you’re looking for a great breakfast, or simply a restaurant with a lot of choices, visit Persy’s Place. You won’t be disappointed. Mom and I will definitely be back, car accident or not! 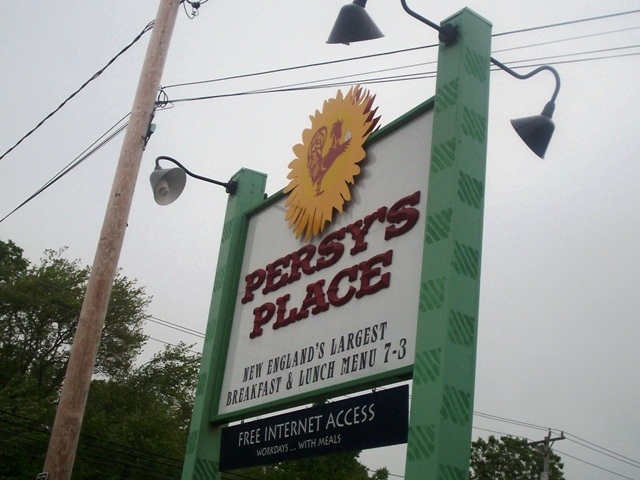 Persy’s Place – all locations – are open from 7 a.m. to 3 p.m. daily. Other locations include Hyannis, Kingston, Plymouth, Middleboro, Mashpee, and East Wareham. 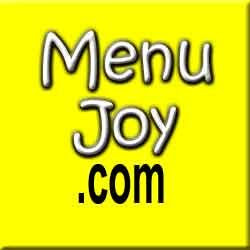 Don’t forget to visit our friends at MenuJoy.com for area restaurant menus.